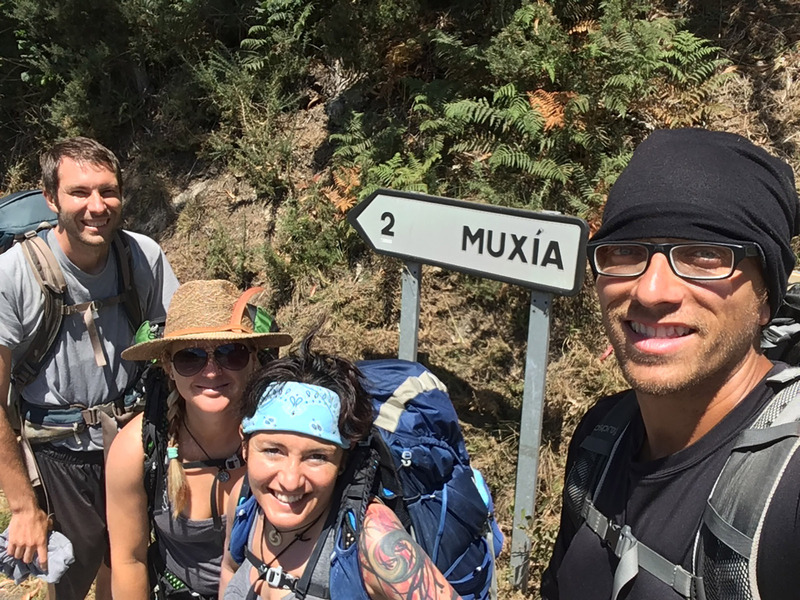 6/23/17 – 31.2km/19.3mi from Finisterre to Muxía. This was it. The very last day. 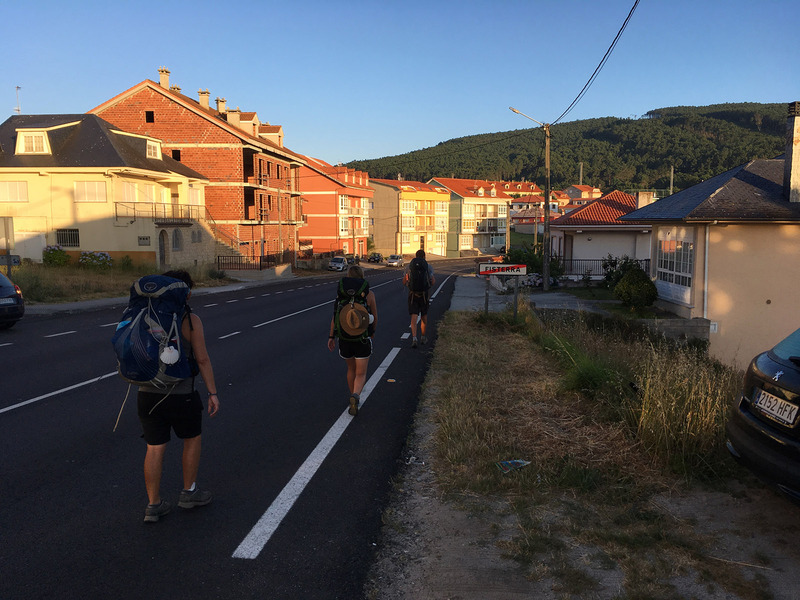 The end of my second Camino. 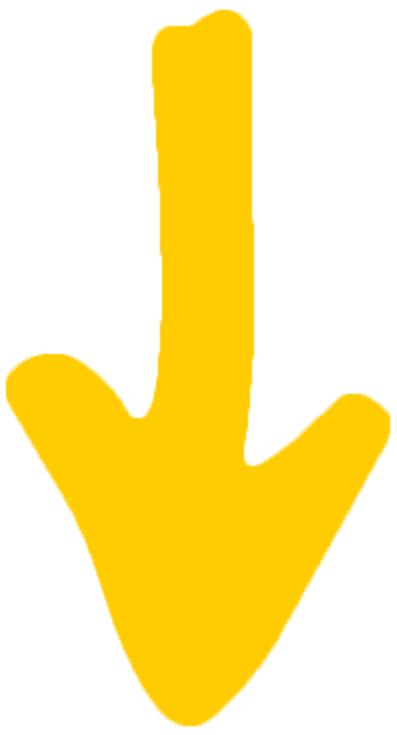 I actually put off writing this for a few days because I needed some time both to unwind, and to figure out what closing thoughts I had. So I guess this is a bit long. I’d summarize everything by saying that these Caminos are long, tough, filled with tests of your strength, endurance, and resolve, and bittersweet at the end when you have to say goodbyes to so many close companions. But they’re also enriching. You grow. You get stronger. You feel alive. You come to believe in yourself in ways you never would have before. They are both life-affirming and life-changing. They’re among the greatest adventures you’ll ever undertake. After all the walking we’ve done in the last 6(!) weeks, you’d think this last day would have been a breeze for us. But not quite. This nearly 20-mile hike had a lot of climbing and dropping, and had only one spot to stop for food and rest. David and I learned this the hard way last time, needing to stop and knock on someone’s door in blazing heat practically begging for water. This time we carefully employed our “chug n’ fill” hydration strategy at every opportunity. Early in the day I felt a foot problem for the first time on the trip – a hotspot that would turn into a blister if not properly addressed. How insane, after 6 weeks, to get a blister on my absolute last day hiking! We stopped at a bench near a lumberyard. 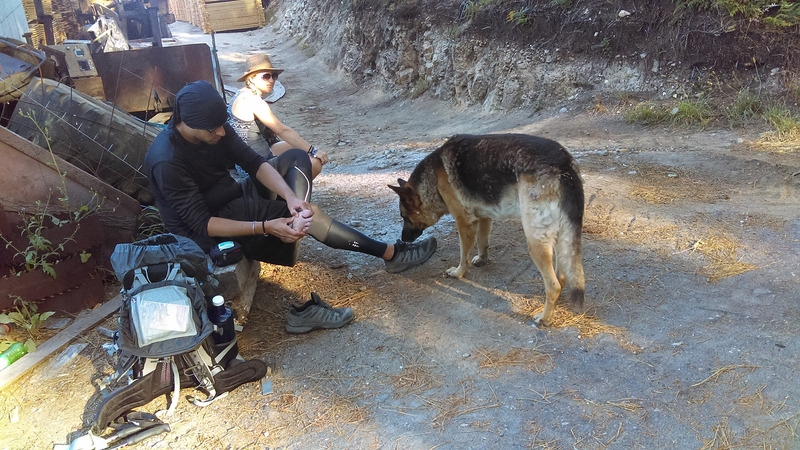 While I was fixing myself up, we were approached by the lumberyard’s really sweet German Shepherd “guard dog” who probably was just looking for some attention, but in some ways felt like she was giving me a little encouragement. It felt nice. All taped up, we moved onward. Midway through the day, about 9 miles in, we found a place to stop for lunch in As Lires. By chance we ran into two old “camigos” there – Al from Albuquerque and “Jersey John” (from NJ, of course). 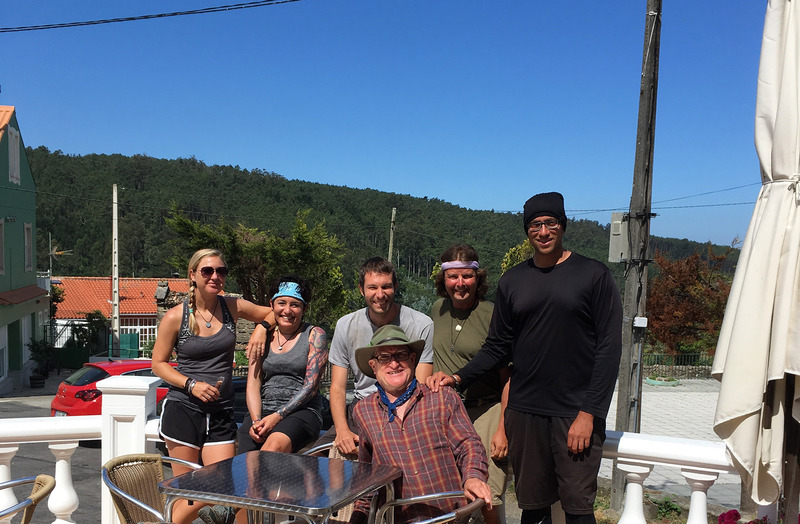 After some good reminiscing and photo time, we said goodbye to them and set off for the last 10 miles of our Camino. And midway through that second desolate stretch, our bodies began to register how much they had been taxed over the past month and a half. I have been lucky enough to not have major foot problems or pains on the entire trip, but at some point with a few miles to go, Serrina, Courtney, and I turned to each other and said “Yup. Ready to be done.” I finally realized just how exhausted I was. Just how much of a toll this journey had taken. 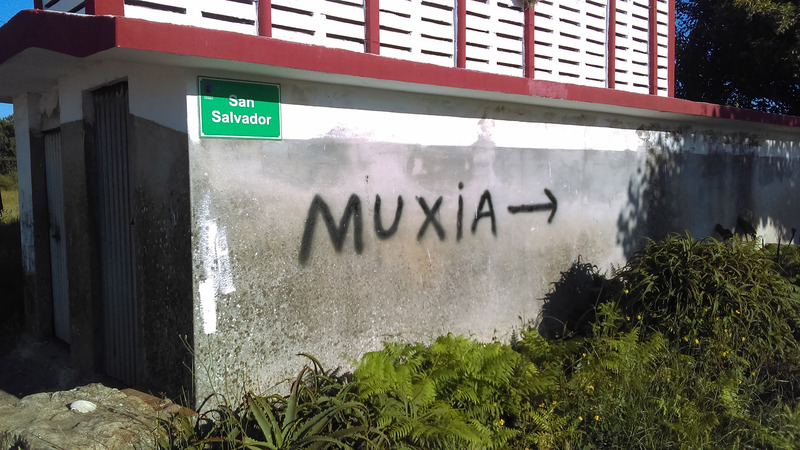 Our entry into Muxía was pleasant and peaceful, not jubilant. 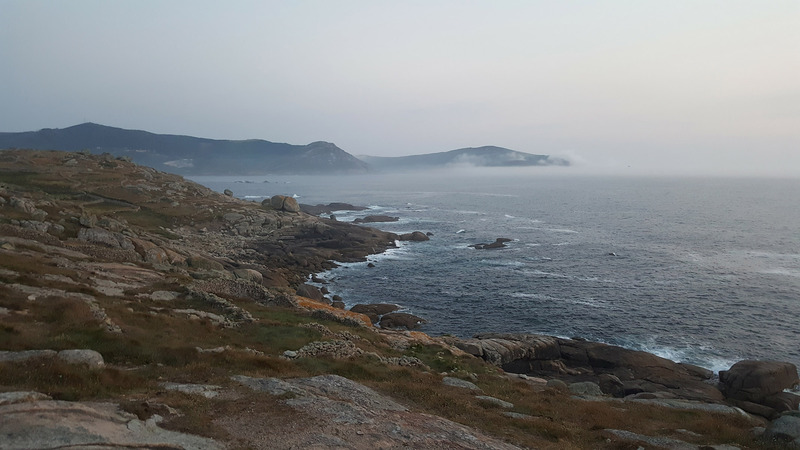 Last time and this time, I felt that Muxía is a more quiet, contemplative place than Finisterre, which is a more celebratory locale. 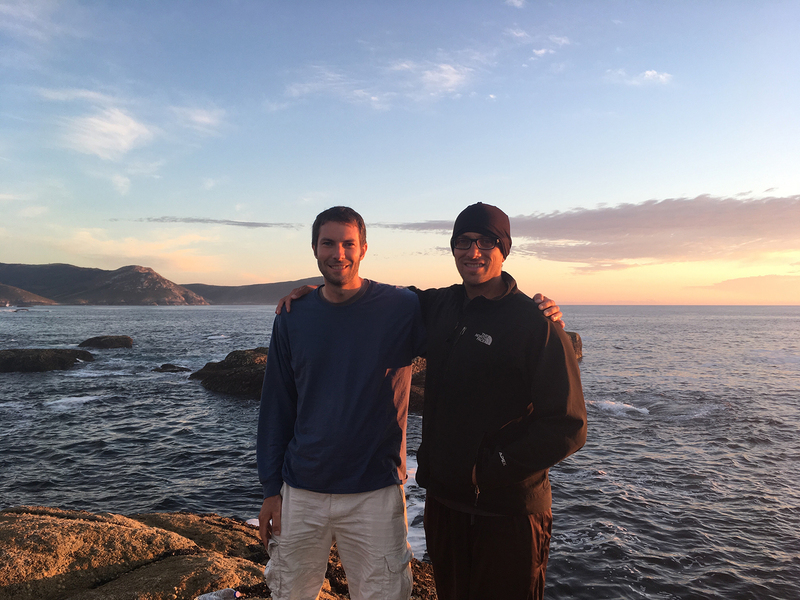 We had one last time of dealing with the typical post-hike to-dos such as showering, washing clothes, organizing gear, making beds, scarfing down dinner, and so forth. 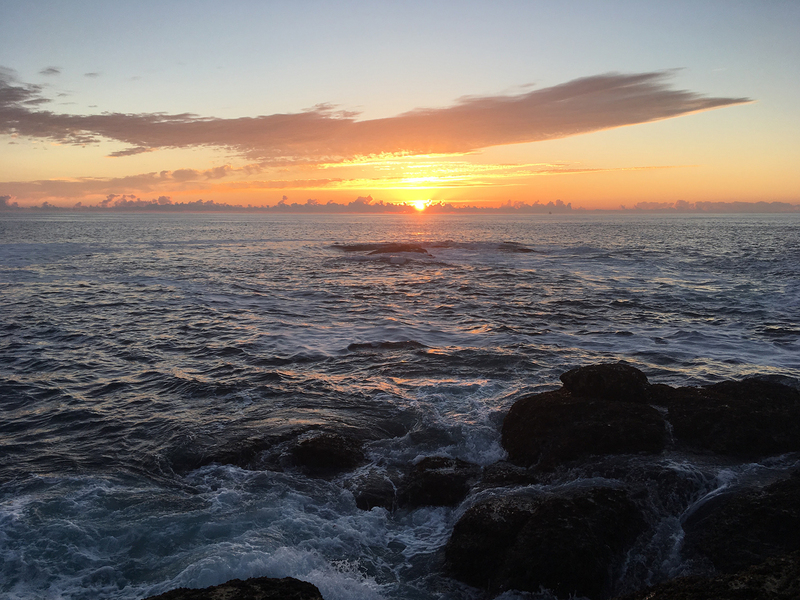 And as the sun was setting we set forth to the Muxía peninsula’s northern tip, to the rocks outside the church called the Santuario de la Virgen de la Barca. There, as last time, as every single day, the waters of the Atlantic Ocean crash endlessly against massive boulders. Tourists and peregrinos alike come to watch and listen at this special place, but I think that relentless crashing carries special meaning for peregrinos. Especially those who walked the entire path. Santiago is a truly meaningful place for those doing this for the first time, or for those who came with major religious goals. Others too, I’m sure. 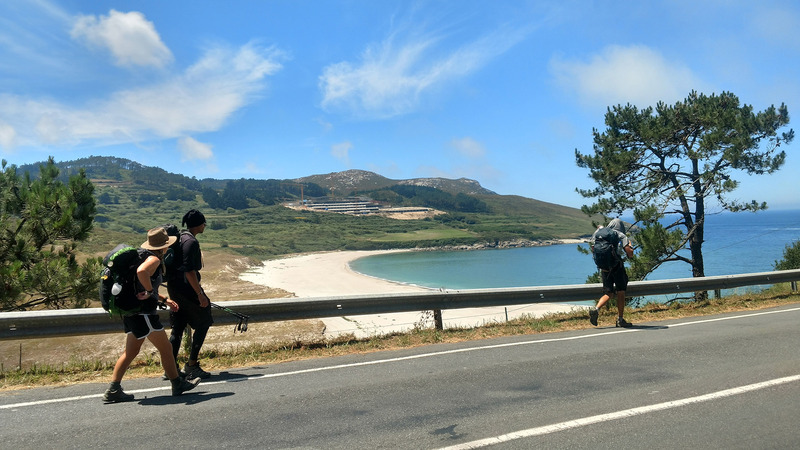 Finisterre is a remarkable place for many more – the joy of seeing the sea for the first time in weeks, and the elation of reaching what was believed to be “the end of the world” can be seen in all those peregrinos celebrating at the Finisterre Lighthouse. I felt that happiness this time around for sure. But Muxía feels… different. It’s an empowering place. That endless crashing of water on rock reminded me – just like it did the first time – that step by step, with persistence, diligence, and vigilance, we can accomplish anything we set our minds and efforts to. Those waters will eventually decimate those rocks, maybe long after we’ve passed. But in the meantime, and for this lifetime, I come away from this trip feeling more empowered, rejuvenated, sociable, charismatic, learned, and self-assured than I have in a long time. I’m glad I took this journey. 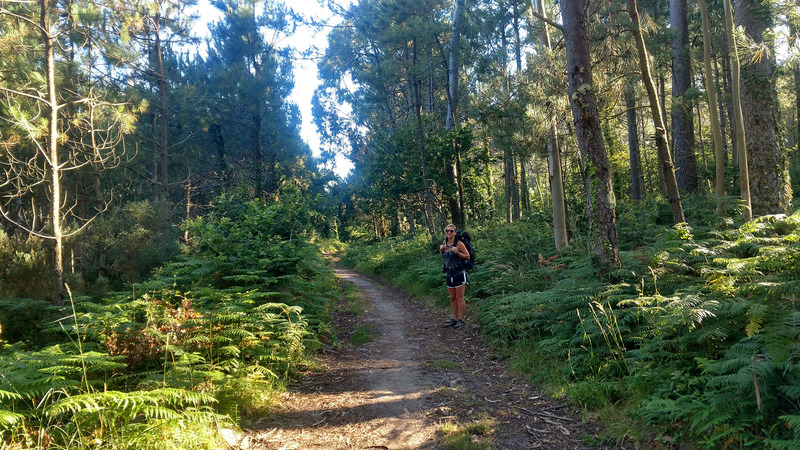 For those of you who have made it through our daily notes for all or part of the journey, I hope my words can convince you of this one thing: go on a Camino de Santiago. Prepare well, equip yourself well, and then fight through the challenges and annoyances – and it will give you everything. Everything you need and more.